I remember being a little girl and seeing my father's collection of cut stones inside little plexiglass boxes, all carefully arranged in black boxes with lids, stacked inside the safe. It was kind of magical, like a treasure hidden in the safe. I would see a row of colorful stones and ask: What's this one? 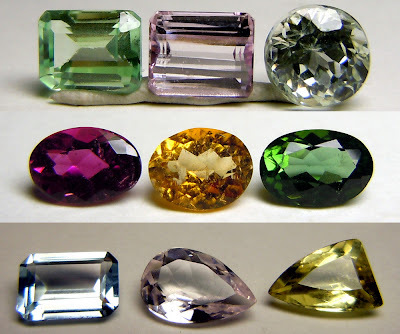 He would reply: Tourmaline. And this? Tourmaline. This? Tourmaline. It would go on for rows and rows. It was my favorite. How can they come in so many different colors? 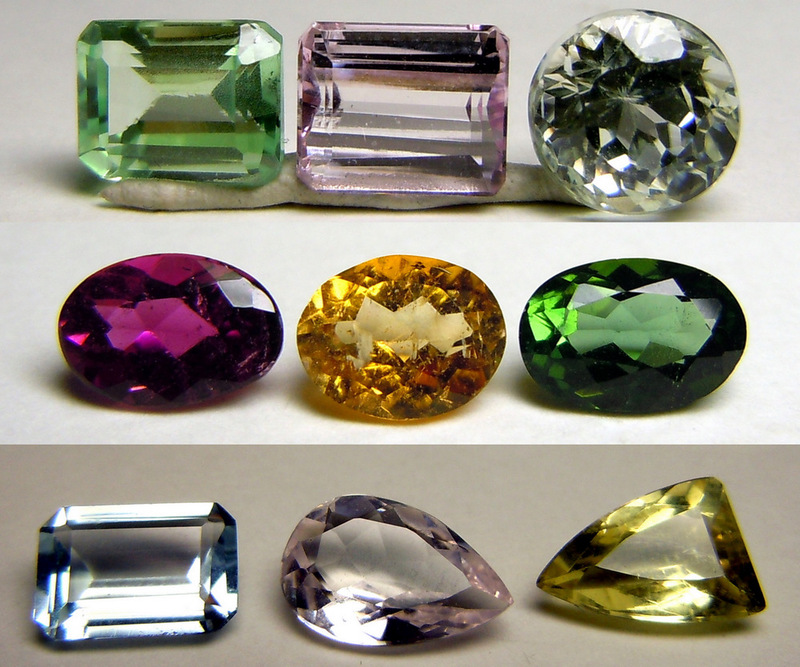 There are many factors that influence color in minerals. My favorite "factor" is impurity. Impurities are elements (e.g., Ti, V, Cr, Mn, Fe, Co, Ni, Cu...) that are not present in the pure compound. They occur in low concentration in the stone. Take Amethyst, Citrine, Rose Quartz, Smoky Quartz. They all have the same SiO2 Quartz formula. What causes the different colors is the presence of chemical impurities. Morganite and Red Beryl contain Manganese. Aquamarine and Heliodor are colored by Iron. Emerald is colored by Cromium. The hues depend on the amounts of each element. One famous example of color by impurity is Paraiba Tourmaline. The bright neon color is cause by Copper. Another interesting fact is that Chromium makes Emerald green, but it also makes Ruby red. I still marvel when I see a Tourmaline in a color that I haven't seen before! Tava aqui falando de vc...e vejo seu comentário no meu blog. I have to tell you, I'm really impressed by your knowledge. Love your photographs and your subject is very interesting! Thank you!